The Maritime Standard (TMS) publishes a regular e-newsletter aimed specifically at the shipping and maritime community. It is delivered fortnightly, on the 1st and 15th of every month, and has built up a circulation of more than 30,000 recipients. It delivers the most accurate, up-to-date news about the market and has built up the largest circulation of any shipping-related online newsletter in the Middle East and India. It is also gaining popularity in other major shipping hubs, including Oslo, Hamburg, Singapore and Greece. The newsletter includes news and analysis from the shipping and ports industries and related sectors in the Middle East and Indian Subcontinent. Topics that are covered include tanker, container, dry and liquid bulk, ro-ro, and cruise shipping; terminal operations; port development; classification; ship repair and conversion; shipbuilding; ship agency; finance and insurance; maritime law; and transportation & logistics. The newsletter regally carries exclusives, analysis and interviews with top executives. For more information, visit www.themaritimestandard.com. The not-to-be missed The Maritime Standard Awards recognise and celebrate success in the shipping, ports and related sectors across the Middle East and Indian Subcontinent. The Awards are now positioned as one of the world's leading shipping and maritime awards dinners and are the premier event of their kind in the region. The Maritime Standard Awards 2016, held under the patronage of His Highness Sheikh Ahmed bin Saeed Al Maktoum, president of the Dubai Civil Aviation Authority and chairman Emirates Airline and Group, attracted close to 700 of the region's elite shipping and maritime professionals, as well as a number of leading figures from overseas. These guests came from a variety of industry segments, ranging from ports and terminal operators to ship owners and managers, and executives from the worlds of maritime law and finance, classification, ship building and repair and maritime education and training. The 2016 event had Jim Clancy, the well-known former CNN news anchor, as master of ceremonies, following on from Alistair Campbell and Ruud Gullit in 2014 and 2015 respectively. As well as 21 general awards categories, the TMS team presented 7 special individual awards recognising the contributions made by high profile industry leaders and innovators. The Awards have set a benchmark within the industry and have become an eagerly anticipated meeting place for top executives from across the business, where they can meet, network and create new opportunities. The Maritime Standard Awards 2017 will take place on Monday, 23rd October 2017 at The Atlantis, The Palm, Dubai. For more information, visit www.tmsawards.com. 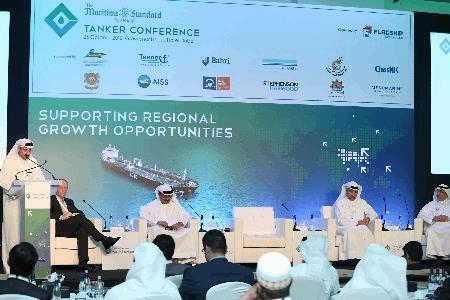 The first The Maritime Standard Tanker Conference took place on 25th October 2016 at the Grosvenor House Hotel, Dubai, and attracted a high level audience who were able to hear presentations from many of the region's leading tanker owners and operators, as well as experts in related fields. Attendees included key decision makers and opinion formers and the event was hugely informative, also presenting opportunities for networking and face to face contact. Those present were given a unique insight into the challenges and opportunities not just for ship owners and operators active in the tanker markets, but those delivering products and services to this sector. For more information, visit www.tmstankerconference.com. The second Maritime Standard Ship Finance and Trade Conference took place at the Sheraton Abu Dhabi Hotel and Resort, on November 14th 2016. Like the first Conference, also held in Abu Dhabi, it was hugely successful, bringing together experts from the fields of shipping, ports, banking, finance, trade and maritime law, among others, to discuss and debate the key issues and trends facing the shipping business, and trade, in the Middle East and the Indian Subcontinent. They willingly shared their insights and knowledge through a series of presentations and panel discussions, signposting the way forward, and identifying the key challenges ahead, as well as the significant opportunities that exist. A high level panel of speakers dealt with a number of themes including regional trade patterns, ship finance and ports and shipping. Speakers and attendees alike praised the content of the conference and the networking opportunities presented. There was appreciation of the fact that leading executives shared their industry knowledge and pointed the way to opportunities to adapt to evolving market situations in line with their forecasts. For more information, visit www.tms-shipfinanceandtrade.com.